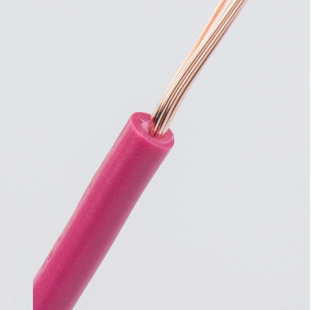 RV PVC insulated cord (ZR-RV, NH-RV)_Guangdong Zhujiang Wire & Cable Co., Ltd. This product is suitable for fixed wiring (laying) of power equipment with AC rated voltage of 450/750V and below. It has a wide range of applications in low voltage power lines, everyday electrical, instrumentation and telecommunications equipment. If the cable outer diameter (D) is 25mm or more, it should be no less than 6D. RV cable has a wide range of applications in the industrial power distribution field, especially suitable for more flexible installation sites, such as electrical control cabinets, distribution boxes and various low-voltage electrical equipment, which can be used for transmission of electric power, electrical control signals and switching signals. . RV wire and cable adopts soft structure design, the conductor has a small bending radius and is suitable for wet and oily installation. At the same time, the RV cable has been certified by the CCC and CE markings and meets the requirements of the HD (EU Uniform Coordination Standard), which can be applied not only to the Chinese market but also to the European market. The insulation material of RV cable is polyvinyl chloride. According to different performance, the product can be divided into three categories: insulation, flame retardant and fireproof. Different classifications are used differently. It is used in places such as control, monitoring circuit, power, line protection and other places with high flame retardant and fire resistance requirements in large construction, petroleum, metallurgy, chemical, cable, ship, and personnel intensive industries. Remarks: RV, ZR-RV, NH-RV are all series of cords, so the structural parameters of the three models are the same. The detailed parameters can be seen below. RV cable can be divided into two types: 02, 06, 08. Different models have different characteristics, and there are some differences in the parameters of structural size.